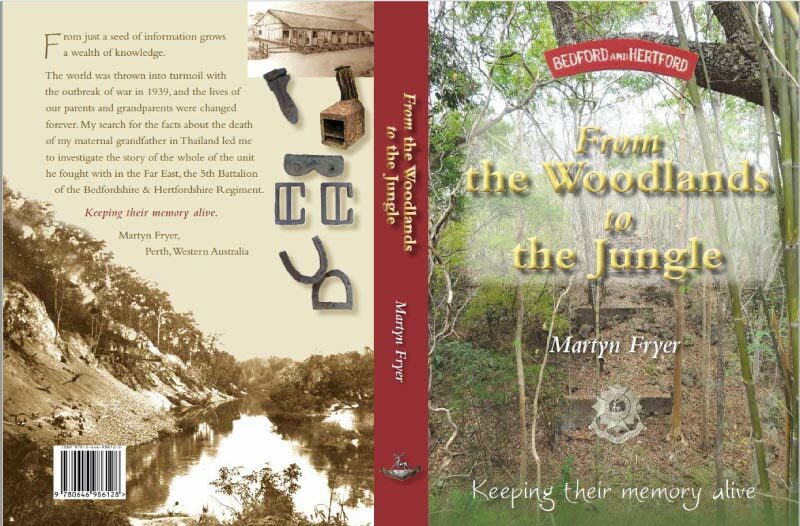 Written with a difference, ‘From the Woodlands to the Jungle’ is the carefully researched story of the 5th Battalion, the Bedfordshire and Hertfordshire Regiment during the Second World War, that follows the path and plight of Private Walter (Wally) White and his comrades from the villages of Bedfordshire, covering from childhood, pre-war village life, conscription, training, mobilisation, battle for Singapore, Thailand to Burma railway, ‘hellships’ and their repatriation. What sets this book apart is the in-depth research that sits behind the story, with contributions from many relatives of members of the battalion, including 102 year old Private William Brown. Special care has been taken to ensure the story avoids re-writing previous works and focuses on the events involving the 5th Bedford’s at a grass root level, achieved by visiting the archives at Kew and Bedford, the battle sites in Singapore and the camp locations in Thailand, carefully documenting and mapping the sites, all included in the comprehensive storyline. Written by mentor, John Cox.